I’ve always made it a point to decorate the dinner table a bit on holidays, even when my only “guests” are Dave and the kids. Even adding one or two decorative elements can make your holiday meal feel extra special! Place cards are one of my go-to decor choices for a holiday table, for a few reasons. First, because having an assigned seat at the table immediately sets the meal apart as a special occasion. Second, having a place card for each of your guests lets them know they are wanted and included at your table. It’s a small gesture that says, “I care about you!” And finally, even the most hastily made place cards can look great, and make your table look great, too. There’s still plenty of time left to put together some great place cards for your Thanksgiving festivities. Today I’m sharing 8 different place cards that we put together, with instructions on how to make them and tips on where to buy your supplies. Hopefully you find something you like, or at least inspired to create some unique place cards of your own! Kraft paper is like the “little black dress” of the crafting world – it’s so versatile! You can dress it up or down to fit almost any decor theme. Kraft paper has a rustic charm to it, which makes it an excellent addition to the naturalistic decor typically found on Thanksgiving tables. If you’re feeling sentimental this Thanksgiving season, make your place cards extra special by incorporating old photos. You could do something as simple as placing a photograph of each guest on a nicely folded napkin. I love the classic look of black-and-white photos, so I used a photo editing program to remove the color from these photos of my parents. I also resized them so they’d be the same size (about 3.5″ square), and then printed them out on a nice cardstock. These place cards look great, and they’re also sure to be a conversation starter at the table. I love this idea because the place cards also double as an exercise in gratitude. I always like to set aside some time for everyone to express what they are thankful for, as a way to remember the meaning of the holiday. This “gratitude tree” is an easy way to do that, plus it look great with your overall decor. I found this Thankful Tree at Target, which included the tree itself and the leaf tags. 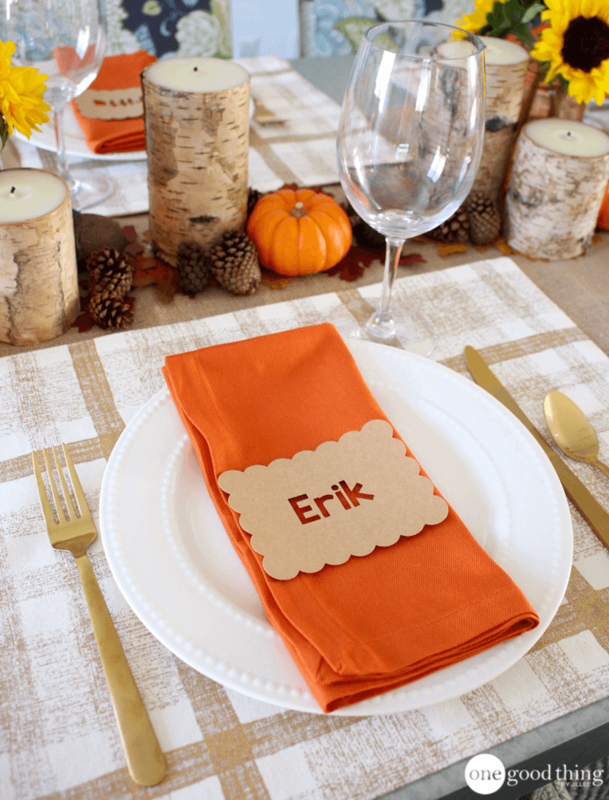 Write each of your guests names on a leaf tag, and attach the tags to your dinner napkins. Then during or after dinner, your guests can write something they are grateful for on the back of the tag and hang it up on the tree. You can then leave it out for people to look at, or read each tag out loud to your guests. If you’re looking for more of a “wow”-factor, the “Drawn Together” Thankful Tree from Caravan Shoppe is a wall-sized version of the same idea. Print the tree out at your local print shop, then let your guests tape their leaves to the tree throughout dinner. This will definitely make a visual impact, and kids will love it! Little pumpkins are a great visual representation of the harvest season! They’re available at many grocery stores, or you can find faux-pumpkins at craft stores. I found some cute paper flags at Michael’s, and placed one in each pumpkin to make some simple and seasonal place cards. I found these large clothespins at Michael’s, but I’ve seen similar ones at other craft stores, too. Use a letter ornament representing your guest’s initials as your place cards. This idea is another two-for-one, because these place cards are also thoughtful take-home favors for your guests! I bought the letter ornaments shown here at JCPenney a year or two ago for a blog post, but those ones appear to be sold out online. But I know that Target has a large selection of letter ornaments as well! I scored a bag of these adorable mini pinecones at Michael’s for 80% off. You can find similar ones pretty much anywhere that sells Christmas decorations, or online. Tie your place cards to decorative wheat stalks for an easy and elegant addition to your Thanksgiving table. This idea is perfect if you prefer more traditional harvest-themed decorations. You can often find wheat stalks in the floral section of craft stores. I put three wheat stalks into a little “bouquet” and tied it off with some twine. I wrote my guests’ names on some gift tags I had lying around and tied them to the stalks. It took about a minute, and I love how they turned out! I love these ideas. Each is so cute and unique. Thank you so much. Enjoyed your post on Thanksgiving table decorating! Now I just need to narrow it down on what I want to do. Do you have a source for the birch candles? I have looked all over for these exact candles with no luck. Thanks again for showing what can be done with thought and not much money!! I purchased some glass markers at BB&B and will be using them on the wine glasses to designate seating arrangement for my 12 guests! Yes, these are really sweet and reminded me of when I was very young, my grandmother used place cards at special meals. I will be doing that as well this year. Thanks for the lovely ideas! Very thoughtful, unusual ideas, indeed, Jillee! I like these place cards very much and will certainly give them some consideration.